In this article are listed the limits of Jedox In-Memory DB Server, Jedox Web, and Jedox Integrator. 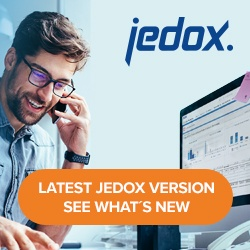 The Jedox In-Memory DB Server has technical limitations for the size of objects, such as the number of elements in a dimension, or the number of dimensions in a cube. These limits are listed below. Please note that these are technical limitations, not recommended values. The number of objects with ID is limited by a 4-byte long unsigned integer. (This corresponds to 2 ^ 32 = 4,294,967,296 objects). The number of numeric values in a cube is limited to 60 billion (guaranteed – can be expected to be 400 billion due to data compression). The length of all string values together in a cube is limited to 4,294,967,296 characters (including terminating zeros). The length of all element names together in a dimension is limited to 4,294,967,296 characters (including terminating zeros). Cube values are stored in double-precision floating point format. Maximum .bin, .csv, and .archive file size is limited only by the maximum file size of the underlying file system. Journal .log files are split into chunks of 100,000,000 bytes each. Practical maximum .log file size is limited only by the maximum amount of files per directory of the underlying file system. 1) The maximum level applies to the sum of individual values as specified at the beginning. 2) The data storage needs approximately 10-15 bytes for a numeric value. A sample database with a realistic dimension with 1.3 million elements needs about 305 MB. 3) We recommend a number in the hundreds range. 4) The number is technically limited by the processing limitations of the PALO.DATA functions to 250 dimensions, but it is strongly recommended not to use more than 30 dimensions in a cube. 5) Tested with 13 million elements.